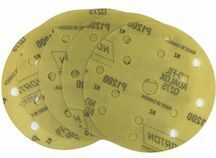 The Norton Pro Film (Q275) disc range has been specially designed in line with the latest requirements in end user applications. With a No-Fil® stearate treatment on top of high performance aluminium oxide abrasive, the new range of film backed discs from Norton are not only tough and hard wearing, but also reduce clogging and dust build-up in all sanding applications. The super smooth flexible film backing provides a consistent scratch pattern, providing the perfect solution for a flawless finish.